Gerber 5 pack flannel receiving blankets. ($10.59 Target stores). size: 30"x 30". These are the traditional square blankets. Pros: lightweight, affordable, easy-to-use. Cons: too small, can come undone Verdict: She sometimes wiggles out like Houdini because there isn't enough material to tuck, but I still like them for the lightweight fabric. Plus I can unwrap them with one hand while holding her, but she will soon outgrow these. SwaddleDesigns organic receiving blanket. ($29.99 Target online). size: 42" x 42". 100% cotton flannel. Pros: perfect size, swaddle instructions are sewn on blanket Cons: heavy fabric, expensive. Verdict: This blanket is perfect for winter, too bad we can only afford one. The Miracle Blanket. ($29.95 on company web site. disclosure: I won this in a giveaway). 100% cotton. Pros: made of lightweight cotton, video demo on website. Cons: lots of material, expensive. Verdict: This bunting is considered the Cadillac of swaddling blankets in many mommy circles. It does an amazing job of keeping Marlie calm and asleep since she cannot undo this blanket. I however found it difficult to unwrap when I needed to breastfeed. Kiddopotamus SwaddleMe. ($16.99 Target online). 100% OCIA Certified Organic Cotton. Pros: Velcro tabs, short wings make swaddling easy. Cons: material is heavier that regular cotton, sound of undoing the Velcro. Verdict: I like this swaddling product the best because anyone can do it! I just put Marlie in the kangaroo-like pocket and secure the wings with the Velcro tabs. The only downside is the loud noise the Velcro makes when you unfasten the tabs...not good if you want the baby to stay asleep. I have no material connection with any of the brands mentioned. No gifts or compensation was received. I am just sharing my opinions. Call me cheap, we just used regular ol' baby blankets and snuggled and wrapped! I couldn't ever fathom spending $$ on special blankies, without knowing for certain they'd like being swaddled. Most babies do, yes. But my OJ...phew. He was different entirely. Money was wasted on pacifiers, and swaddling blankets would have been a waste too. Of course, $$ was why I breastfed. Maybe I'm just cheap after all. ;) Happy Thursday Teresha! I love the Miracle Blanket but my husband can do it with regular receiving blankets. 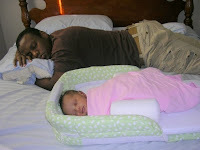 How do you like the co-sleeping thing in the picture? Are you planning to review that? I am considering getting on if it is really helpful for lying down breastfeeding. THAT is the most precious picture! I love it! Isn't it great having a beautiful baby and a wonderful man? I think you should frame that picture and put it in Marlie's room! Those two are the best things that ever happened to me! the co-sleeper is the Snuggle Nest. I didn't think to do do a review on it, but now I will. thanks for the idea! You're not cheap, just not into wasting $$$ on fads or unnecessary stuff (I know someone like that...oh yeah, me!) Marlie won't go to sleep unless she snuggled: in someone's arms, in my wrap, or swaddled. She's one of those cuddly babies. Damon prefers the regular blankets, but I can't do the swaddle with them. My husband was a pro with the regular blankets. He could make them into little baby burritos like no one I'd ever seen. When I did it, they were off by the time I went to pick them up. After I discovered the Kiddopotamus ones, we used those forever. My kids were both born in winter, but I KNOW we had a thin cotton one too.. I really want to try a Woombie when the baby gets here. Have you seen these? They are only 23.99, which is not too bad compared to some of the other products out there. They allow baby to move while still feeling comforted, and they have different materials for different seasons/climates. I really want to get one! Another type of blanket that we happened upon because Leah was a warm weather baby too: muslin gauze blankets. SOOOO breathable. Great for strollers in warm weather, or layering in colder weather. They are a little pricey (I think around $40 for 4 blankets), but Leah is using them as crib blankets now too. I think the brand we have might be Aiden & Anais? That picture is adorable. I have a few of those myself - hubby and baby sleeping. Anyway, thanks so much for sharing the great swaddling blanket options.